The Battle Log is the place where reports from each of the Operation 513 evangelism teams are posted. It gives you a brief idea about what occurred during the outreach and some of the highlights. Even though there is not a report from each team on the Battle Log every week, all these teams do meet according to the schedule (usually weekly). So please keep them in prayer and consider joining one if it is in your area. You can keep track of the reports that posted here at the battle log using your RSS news reader - XML feed. The following teams no longer meet, but thankfully you can still read their reports: Canberra (ACT) Team, London Team, Scotland, Sheffield Team, Skypecast, Sunshine Coast, Melbourne Team. On Saturday it was a beautiful Easter weekend with many people out to enjoy the sun up on the Hoe and many beaches around Plymouth. The City Centre was very busy, and Simon, Laurie and I had many good conversations, particularly with a Romanian lady and he friend called Luminata and Dan. 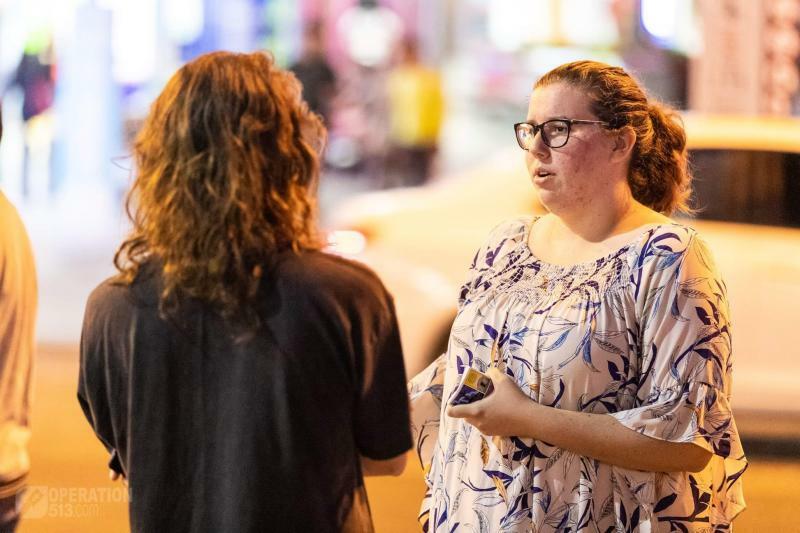 She was very insightful and asked some really good questions while going through the flip chart good person test with her, and she took a Bible and some tracts and said she would think about what we talked about and what good Friday and Easter Sunday truly meant. 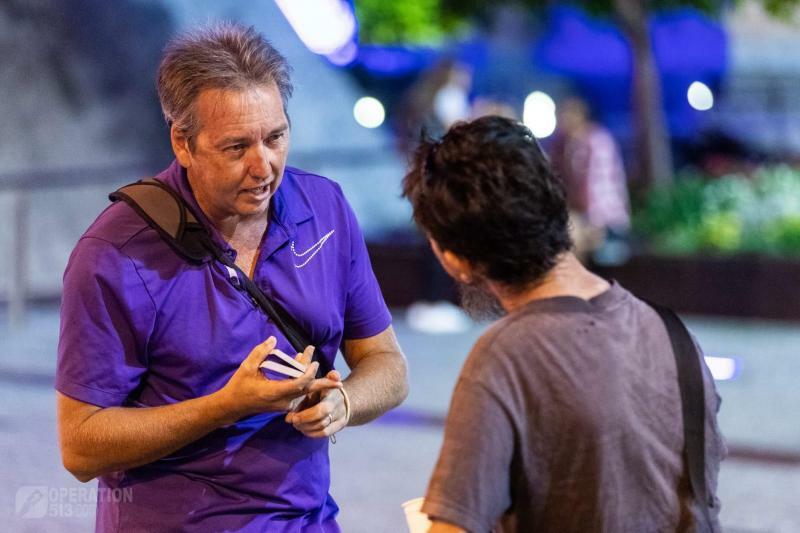 Laurie spoke with a man that said he had come out of the Mormon church a while ago, but was sort of in limbo as to what to do now or what Church to attend as was weary of everything that had happened to him. 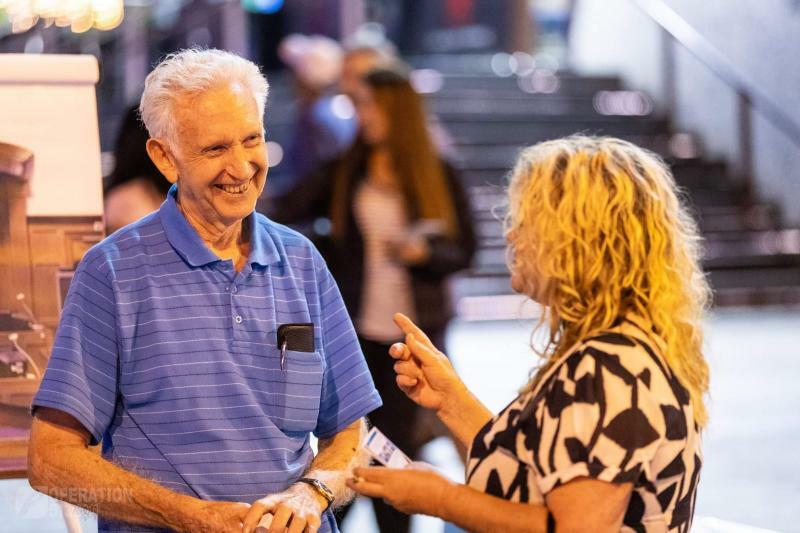 Laurie managed to share the truth of Christianity with him and the gospel that assures our salvation rather than the false message Joseph Smith taught, and he gladly took a Bible and some tracts and we pointed him towards some good churches he could attend. 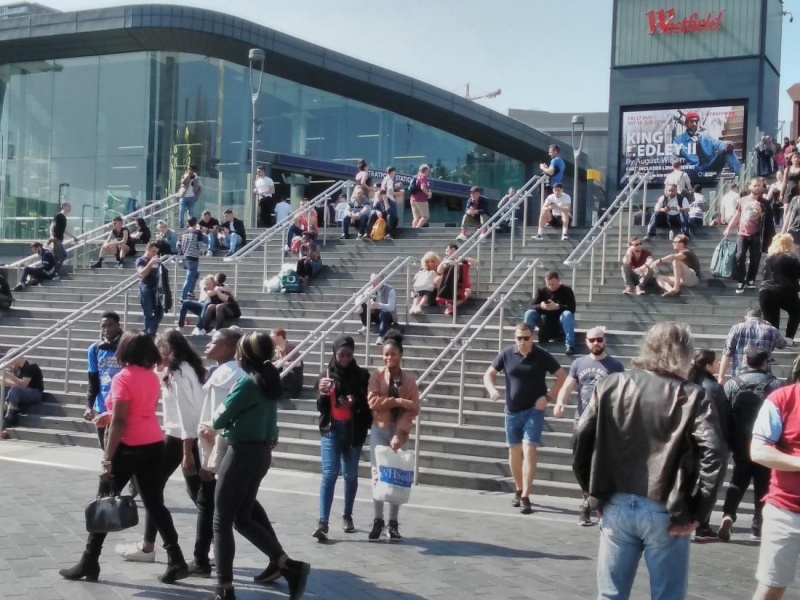 I spoke with two two young builders that walked past that were seemingly quite shocked as God and their eternity were the last things on their mind on such a sunny Saturday, but they understood and took tracts and had a firm handshake afterwards which was good. A friendly young man called Casper stopped to look at the intelligence test, and he said he had done really well at Math's when at school and had gotten all A's, but was quite embarrassed when he got a few of the questions wrong! I preached about the magician and escape artist Harry Houdini and his death defying stunts and his interest in the afterlife and trying to communicate with his wife after death, and I explained how Jesus was the ultimate proof there was life after death due to his literal death and resurrection with no other explanations or excuses people could make apart from the fact that he was fully man and fully God and took the punishment of sin upon himself and verified his message by raising himself from the dead. 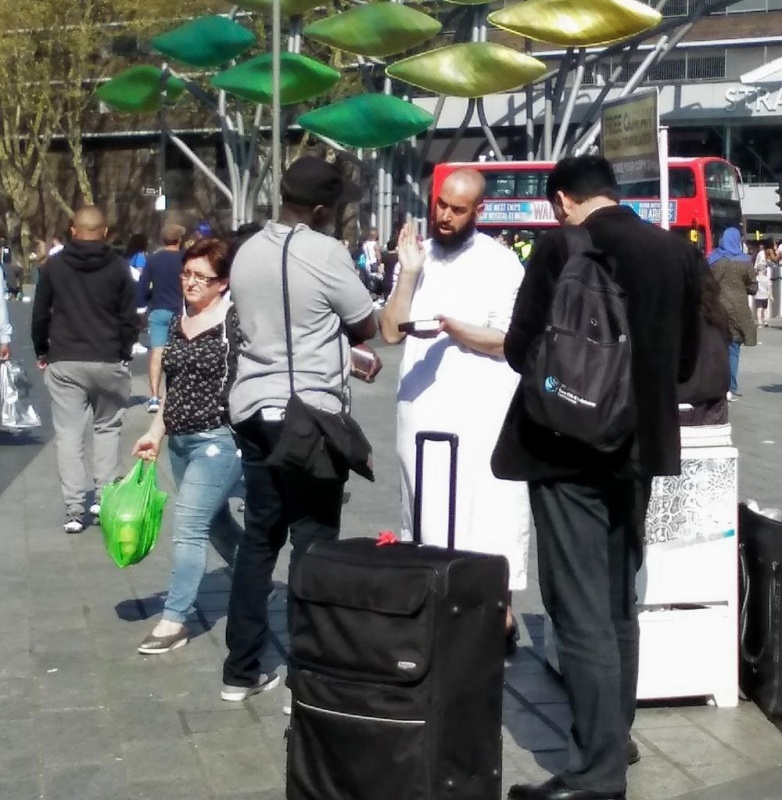 Simon spoke with lots of people too and preached, and at the end Laurie engaged with a Muslim couple that walked past. This was very interesting and we all spoke with them for around 20 minutes, the wife seemingly very interested in what we had to say and eagerly reading the tracts we had given her, while the husband was quite liberal in saying the Koran does not teach violence against Christians and Jews and we were to have peace together because we all worshipped the same God. This led to some dialogue as to the trinity and how as a Muslim he had assurance he was going to heaven when he died. The man appeared to think he had forgiveness from Allah and knew he would go to Heaven- he had memorized the Koran and just thought Allah would forgive people who repent, but we all told him that without a sacrifice to pay for them he was still in his sins, and why Christianity offered the only way of salvation for everyone. 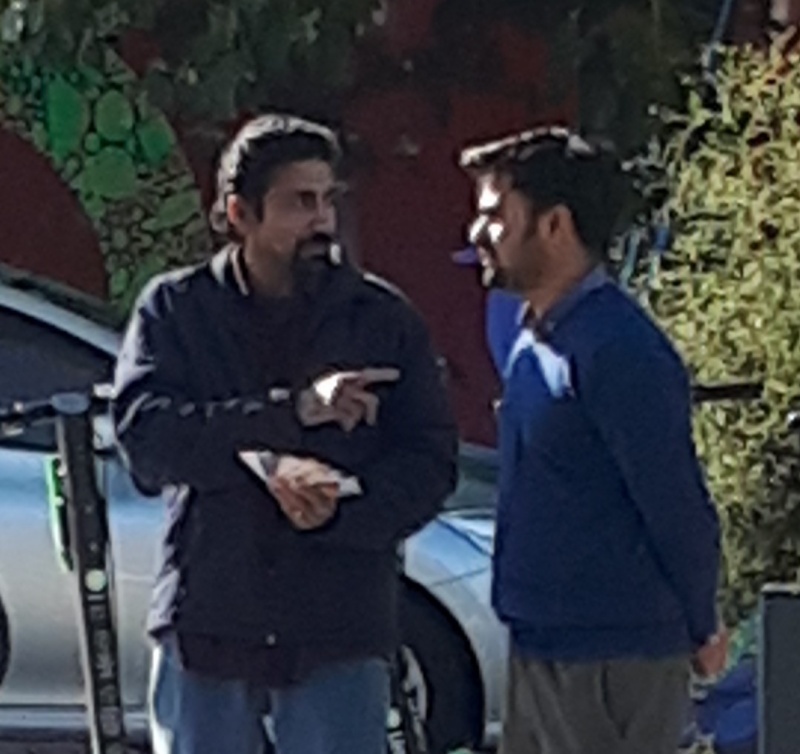 He said he would come and speak to us again which was good, but we pray his wife particularly searches the scriptures in what she read and we can meet with them again to chat and share the gospel with them. 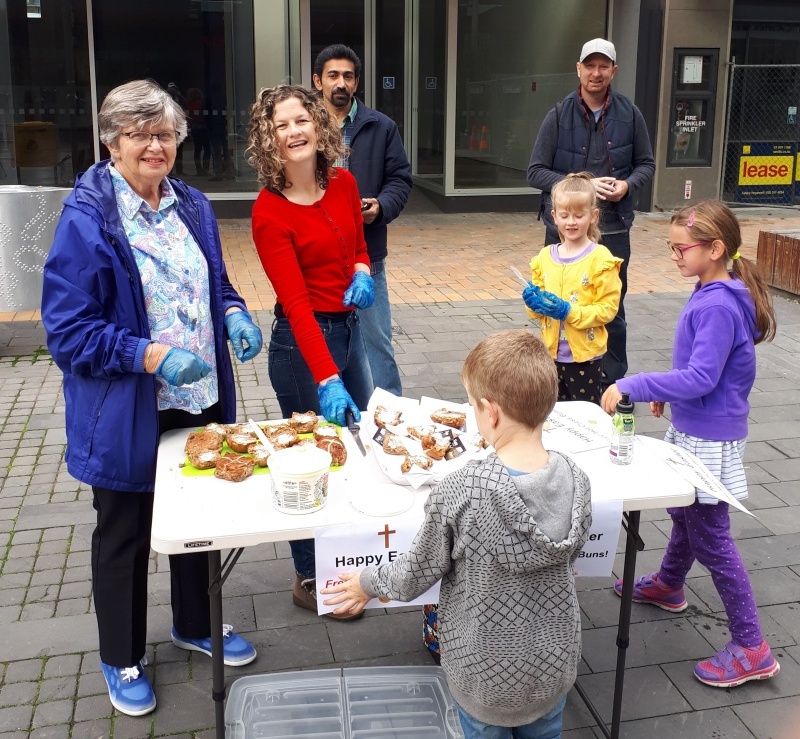 Saturday saw the first of two Easter Hot Cross Bun and Gospel Tract outreaches of the long weekend. 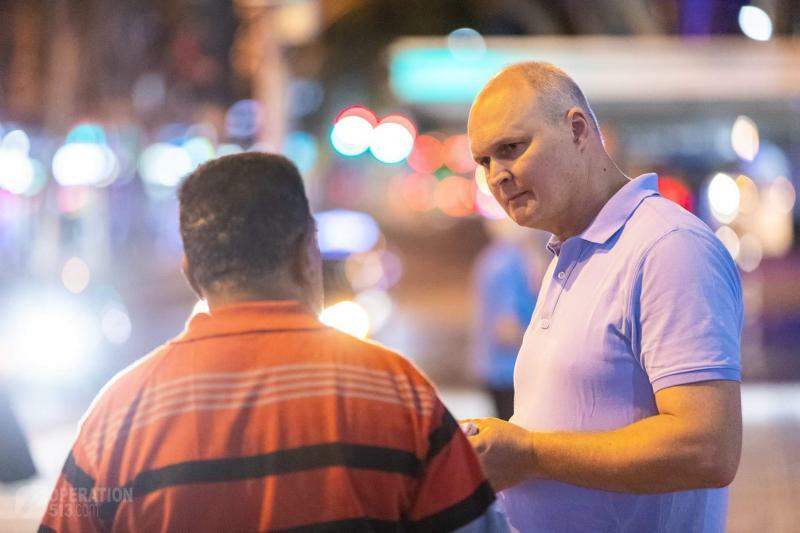 These outreaches are designed to be very easy for Christians to be introduced to sharing the Gospel on the street. 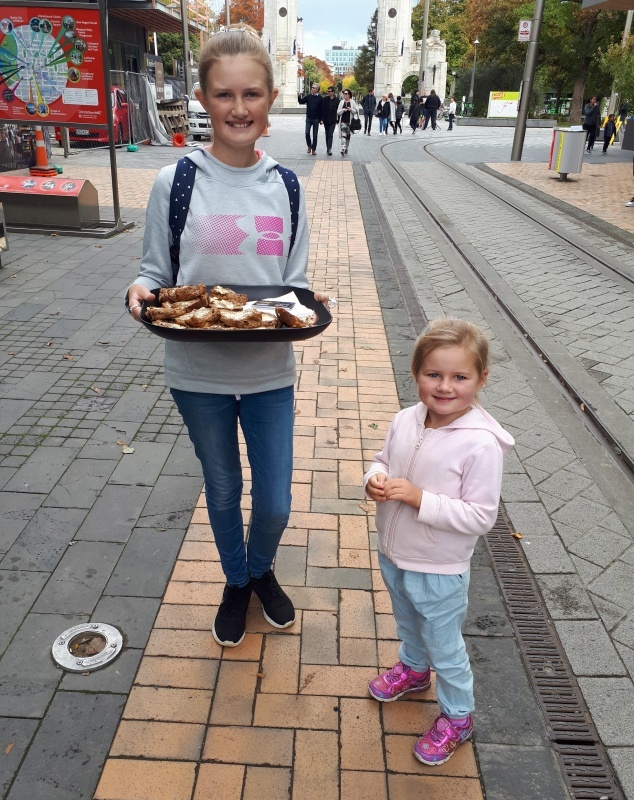 People love getting free hot cross buns and are more than happy to take a tract along with it. From that regard, the outreach was a wonderful success. 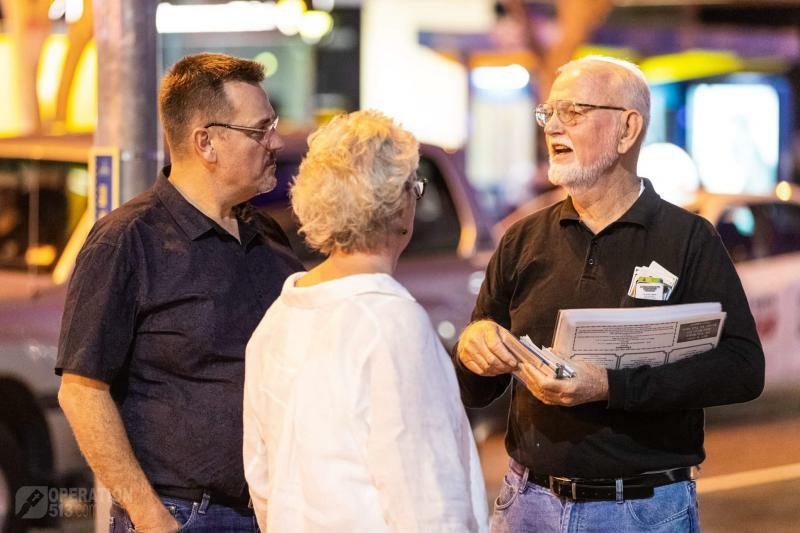 Many Christians took the opportunity to get involved and share the law and the wonderful Gospel of God’s grace. 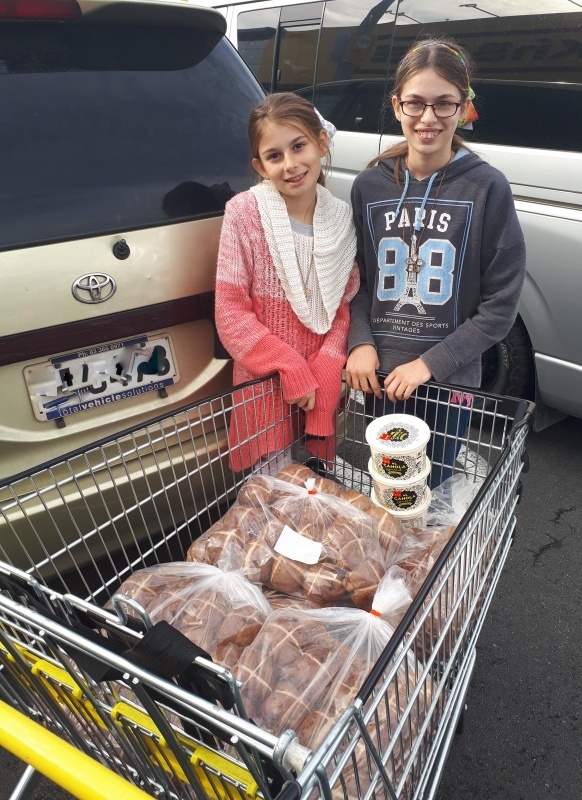 500 hot cross bun halves were given away, with nearly the same amount of tracts. Flip charts were also set up, and many Gospel conversations were had. Sunday was wet (again), but it wasn’t raining when we went out in the afternoon. 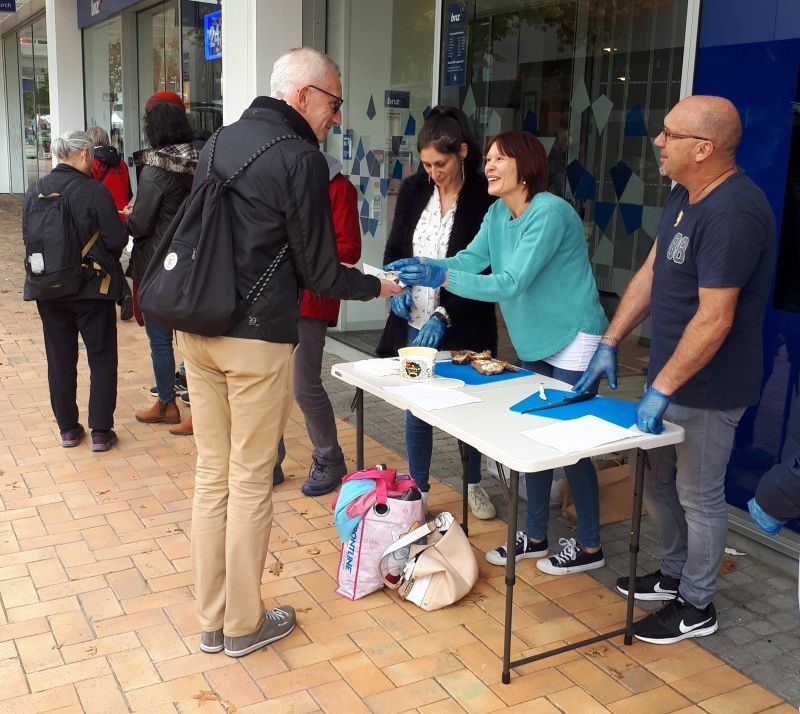 The shops were closed for Easter, but lots of people were in Cathedral Square and the outreach was filled with Gospel conversations. Greg had a wonderful conversation with a young couple who gladly took a Gospel booklet. And as I was in the middle of a conversation with four teens, another group of teens walked past, and one of them called out: “Hey, there’s that guy who had talked to us outside my house”. 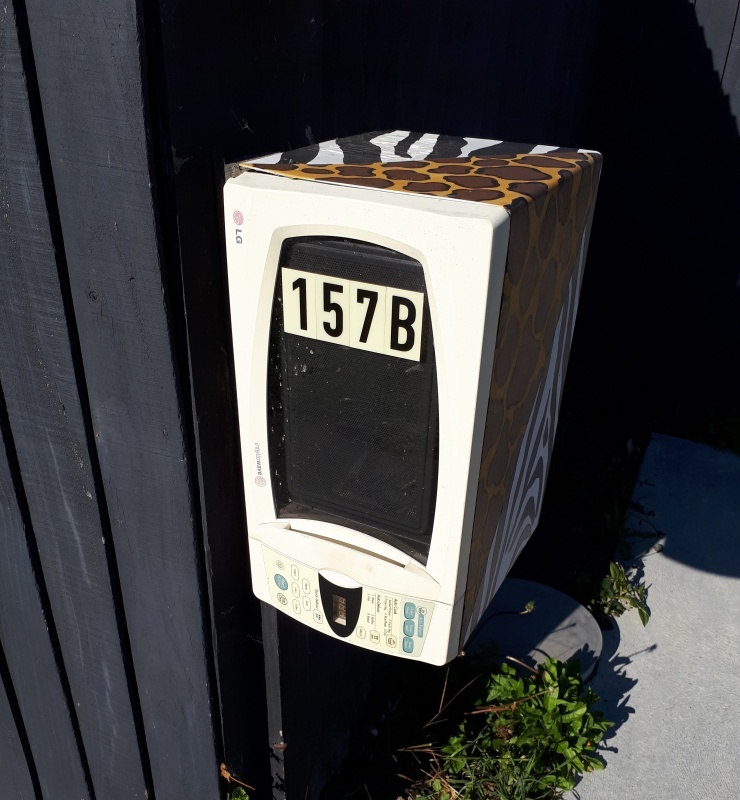 I recognised two of them as guys I had approached while I was letterbox dropping just two days prior (in a suburb on the outskirts of Christchurch) and had briefly shared with them! Praying that more labourers for the harvest would get involved and that the canvassing of this city with the Gospel would continue. All to the glory of God. Operation 513 was in Stratford for outreach this afternoon. Again it was heaving with people on a warm, sunny Saturday. There was an opportunity for amplified street preaching, so I took advantage of it and preached for an hour. I emphasized the importance of the resurrection and cited many verses from Romans 5, Ephesians 2 and Psalm 103. 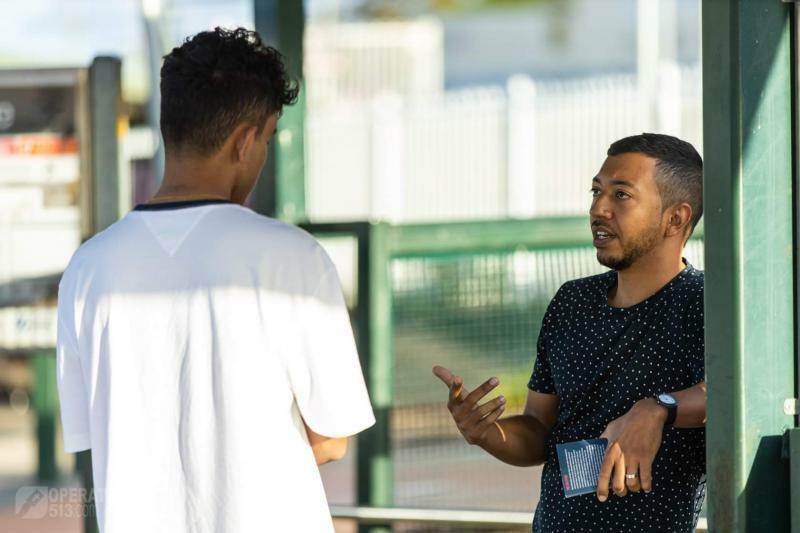 ​Arnell from the Philippines waited for me to finish before he started preaching himself. The police past by once and allowed amplified street preaching today. Praise God for that. 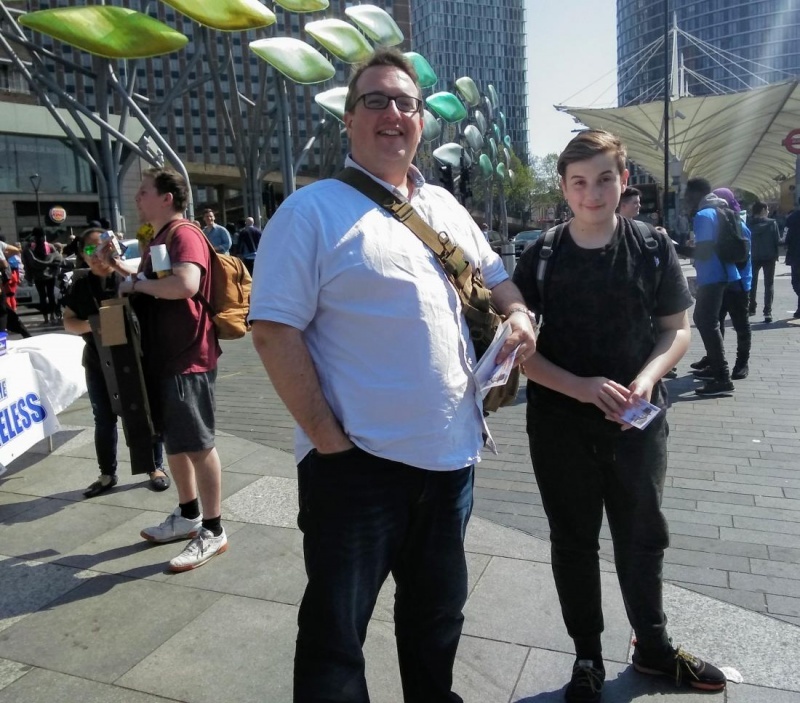 Pastor Ben Jones from Fryerns Baptist and his son Harry joined me at 2 PM and handed out tracts. Jacob came later and had many conversations. I had a long conversation with Mark the JW. He openly said that he is not born again and it didn't bother him one bit. Although he did claim to have the Holy Spirit. Jacob and I also locked horns with Samir again as he handed out his literature. 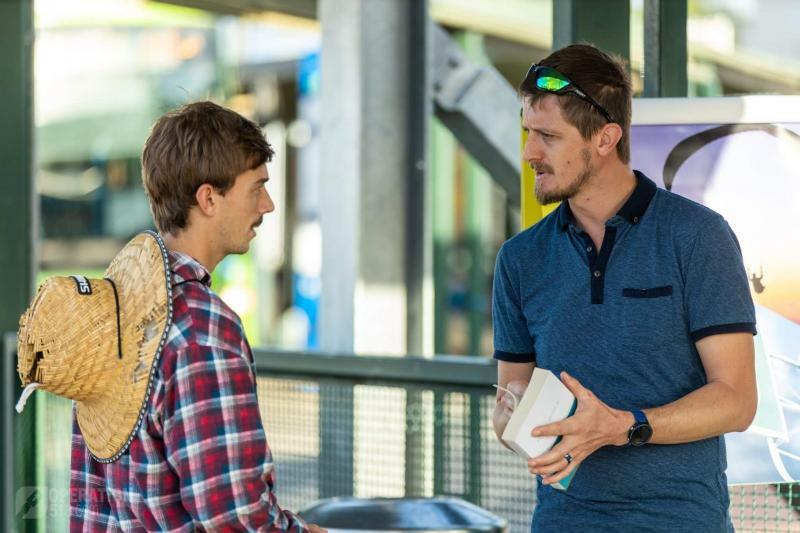 Jacob had a number of conversations doing the 1-on-1 evangelism that he loves. He asks that you pray for Adrian and Michael, to men with whom he had lengthy conversions. The last 2 days of outreach (Thursday and Friday) have been very encouraging - filled with follow up conversations. For 3 out of 4 of the last Thursdays, as I head into the city for our regular outreach starting at 1 PM, I have encountered the same construction worker sitting enjoying his lunch. 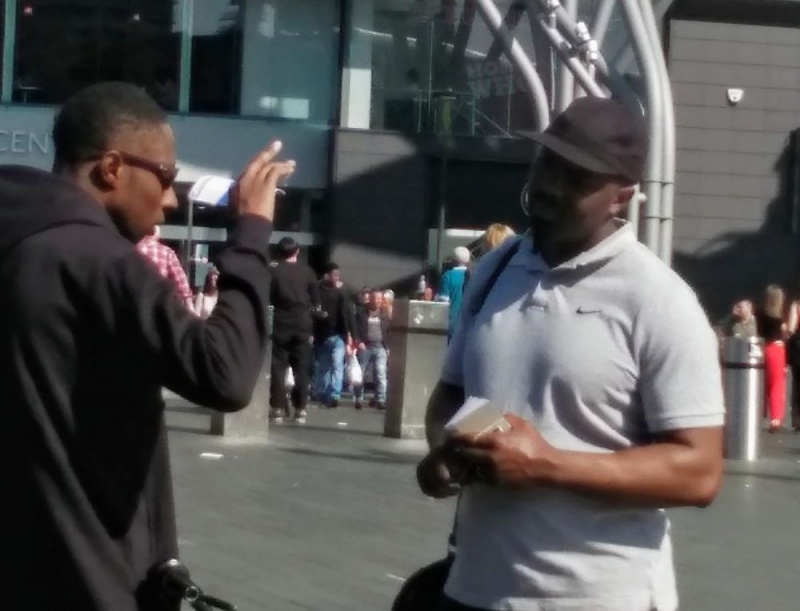 The first time I shared the law and the Gospel and he was very receptive, accepting a Bible and Gospel booklet. 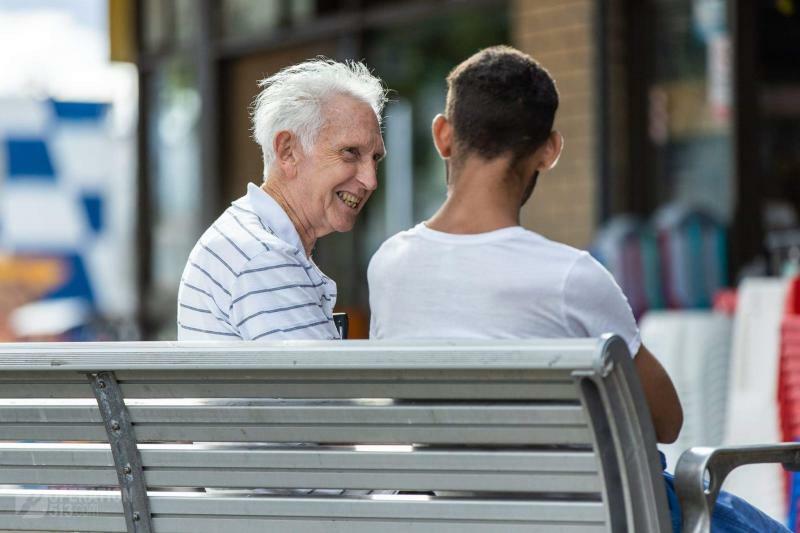 The 2nd time I saw him, I challenged him if he had read any of the Bible - which he hadn’t, and I again communicated the urgency to respond to the Gospel. Well this Thursday, he said he had started reading the Bible, but he didn’t take my advice and had started with Genesis. 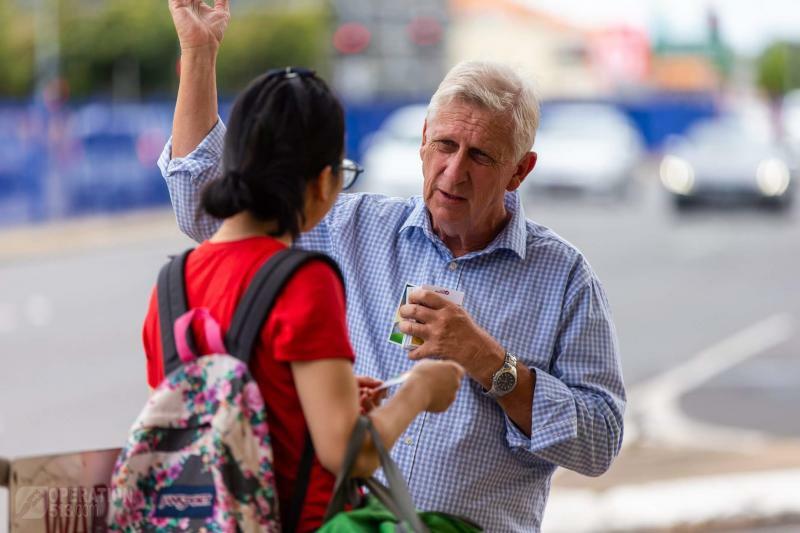 I again took the time to explain the need to respond to the Gospel, again taking special note to highlight the law (which brings the knowledge of sin - without which there can be no conviction, and without that there will be no urgency for the grace of salvation). I pointed him back to the New Testament, and the Gospel booklet. He seems so close to the kingdom, and yet so far - and it’s completely out of my hands. Salvation is of the Lord. I will start regularly praying for my new friend. He has my contact details and the contact details for my local church. Later, in Cathedral Square, two guys that have heard me preach, and I have seen - and talked to - multiple times before crossed my path again. I asked if they had put any thought into the Gospel - which they hadn’t. Knowing that this may be the last time I see them, and having talked to them many times before I felt a need to be direct with them about sin and the justice of God: Hell. They both lowered their heads, looking intently at the ground as I urgently pleaded with them to "wake up". Of course, I reiterated the hope there was of forgiveness of sins, only found in Christ. I also preached in the Square, and Andy and I had other conversations. A very encouraging outreach. 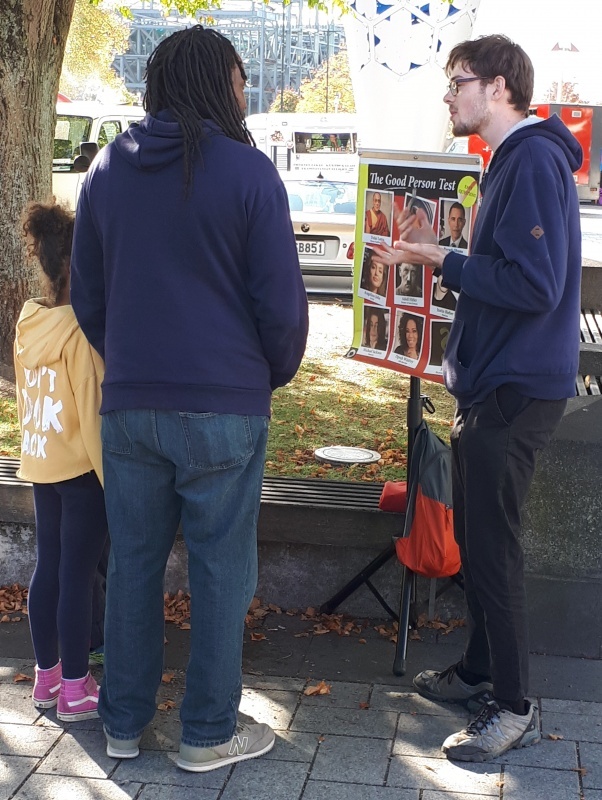 We then moved to Eastgate for two hours, which is always a busy and good outreach. Good Friday! What a wonderful day to be in the city to talk about Christ. A team of 4 were involved. The highlight conversation for me was yet another follow up. But this time it was with a guy I had been talking to a year ago. He remembered me, but initially I didn’t remember him. He too seems close to the kingdom, but knows he has not entered it. I had a good long chat with him, while Philip talked to his friend. It turns out he lives around the corner from me, and is not far from my local church. He accepted a Bible, and I challenged him to read Romans (esp. The first 3 chapters). He also took my contact details. I pray that Christ would show him his sin and “wake him up”! Looking forward to the first of our two Hot Cross Bun and Gospel Tract outreaches tomorrow. Your prayer is appreciated! On Tuesday afternoon at Woodridge there was a team of six out again! Praise God for raising up labourers! What a privilege it is to serve God alongside other men and women of the faith as they declare the glories of the gospel to the lost of this world. 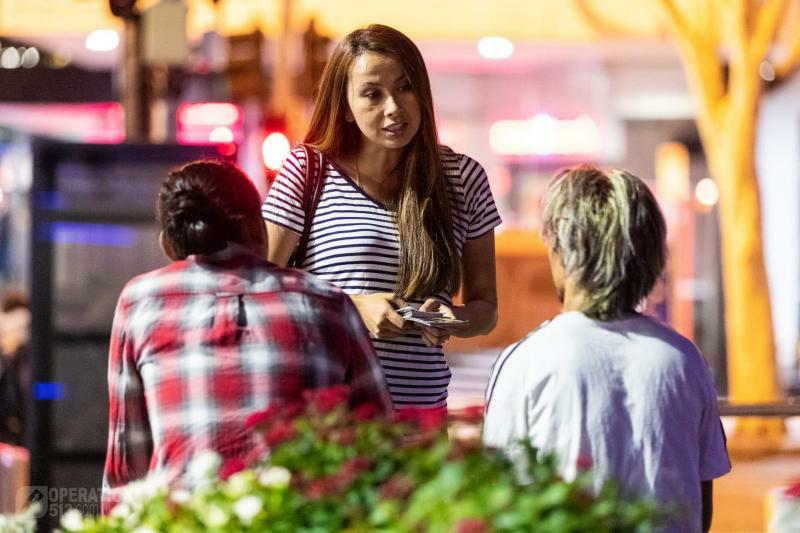 The conversations on Tuesday were normal, "Woodridge", with many people of mixed religions. Firstly was with Diana, a lady who once was a Christian but left it because she didn't know much about it and said she was now Buddhist because it sounded cool and she liked it. It turns out that she really didn't know much about Buddhism either but simply wanted to come back to this world and have another go at life because life is fun. She was shown how we know God exists and therefore that Buddhism cannot be the way and as she was shown the law her bus arrived. 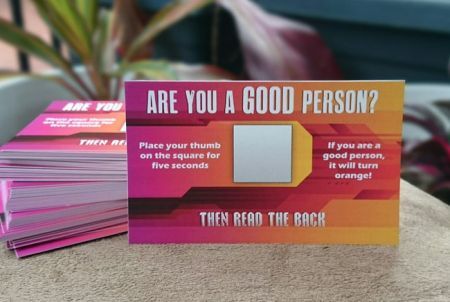 She took a tract and was encouraged to read it. Next was a conversation with Liam and Bella, a young couple who were kissing just before they were approached but ironically when asked if they'd ever lusted later at first they said no. 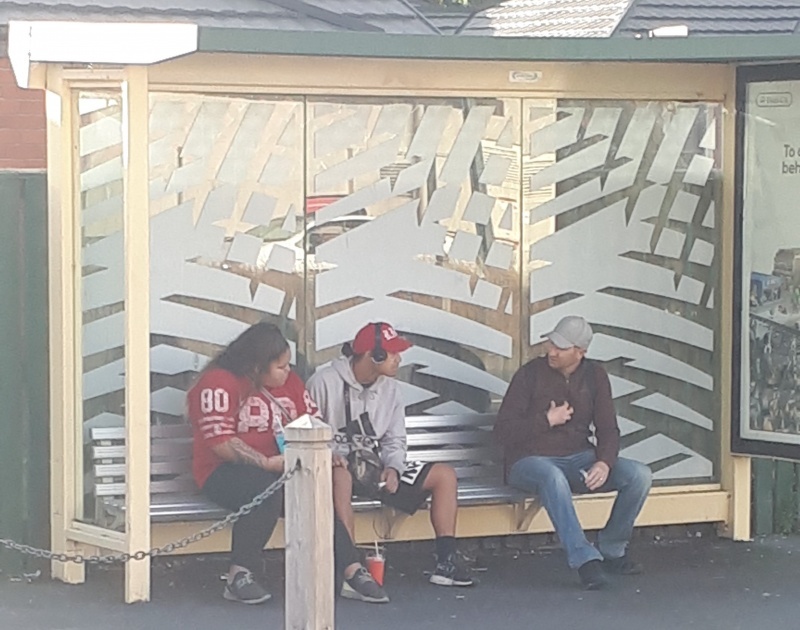 Before their bus arrived, these two who at first said they didn't think there was a God, came to acknowledge that there must be one and then after seeing his law saw their guilt. When being posed with the question, "How can your sin be forgiven?" their bus arrived and they were very briefly shown that goodness doesn't take away badness, rather someone must pay. 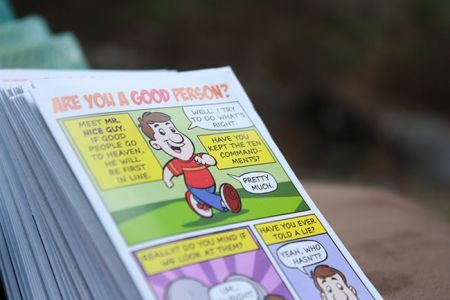 They took tracts and were encouraged to read them. 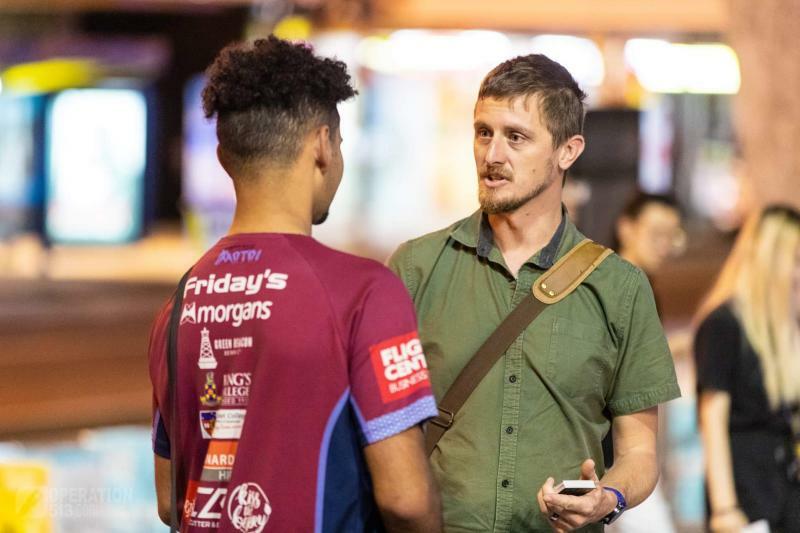 A lengthier conversation took place with Damo who at first was an atheist but it wasn't long until he rejected that, saw that there was a God and therefore was seeing what God had said. 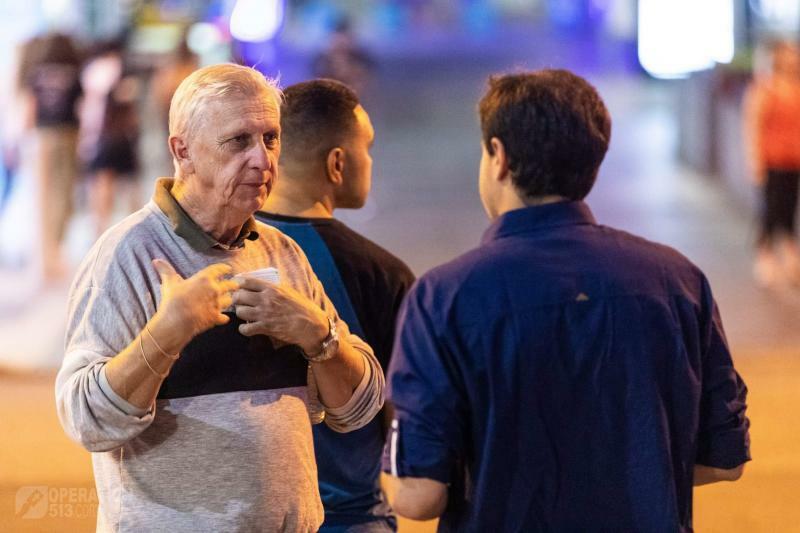 He understood his guilt and that he deserved Hell but even after eight times explaining the gospel in different ways he could not grasp the simple message that to be forgiven one must simply trust in Jesus. He seemed to struggle so much. It wasn't even that he was still trying (like most people) to say, "trust Jesus and do good works", he just didn't seem to grasp how Jesus' death could atone for sin. There was a level of struggle because of drug use but he didn't seem all that out of it. He did take a tract though, may God use this to cause him to understand the Gospel! Please be praying for Diana that she would see the folly of chasing things that make her feel nice, rather than that which is true. 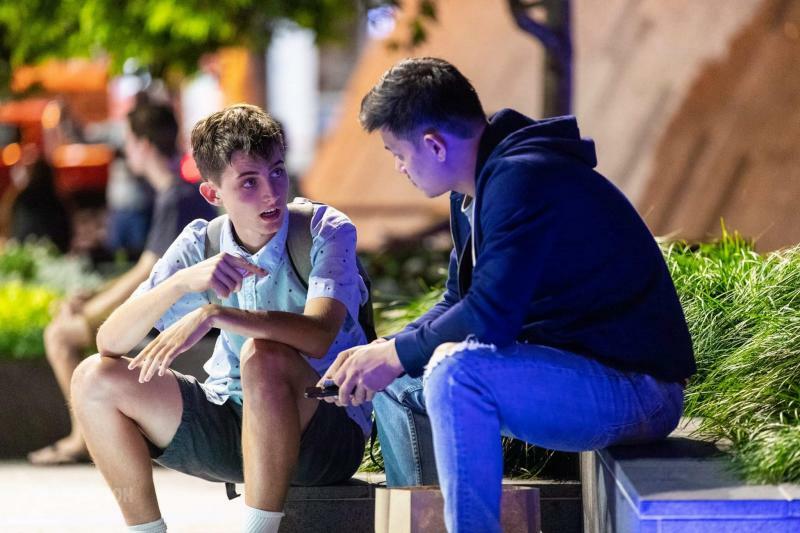 Please pray for Liam and Bella that they would seek to know how Jesus' death on that cross can make sinners right before God and please pray for Damo that God would enable him to comprehend the gospel and that he would come to trust in Christ alone for for forgiveness! 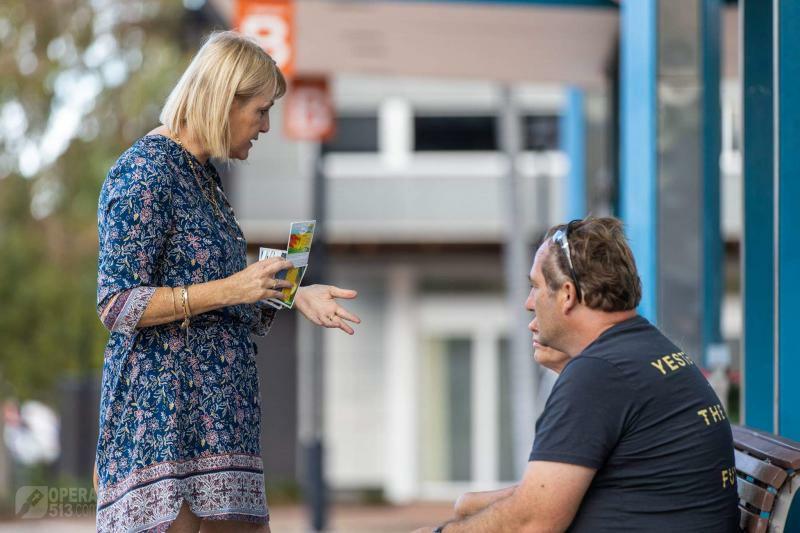 On Saturday in Brisbane City out came the team to tell of the glories of our God and King. There were twelve members out and many conversations had. Like usual some newer members tagged along with more experienced members and learnt some techniques and answers to improve their evangelism. An early conversation took place with a tall man, who was very proud. He declared to know all about the different religions, followed by declaring that Christianity is the same as the rest. Invalidating his original claim, to know about all religions. He was shown God's law and very hesitantly he engaged but not without protest as he didn't want to be shown his guilt. He tried a lot to get out of guilt by declaring that he had "repented of all his sins". When asked what that meant, as usual he declared, "asking God for forgiveness and trying not to do it again". He was shown firstly, that this is not what repentance is, rather it is a change of mind, and secondly that it has no ability to atone for sin. He carried on and never got to hear the gospel because he was too interested in his own ideas, to proud of his own discoveries that he wanted nothing to do with the real Jesus. He left proclaiming that after day of positivity the team had ruined his day with all this negative talk. He was reassured that the intention was not merely to condemn but that he didn't acknowledge guilt so there was no reason to share with him the cure. 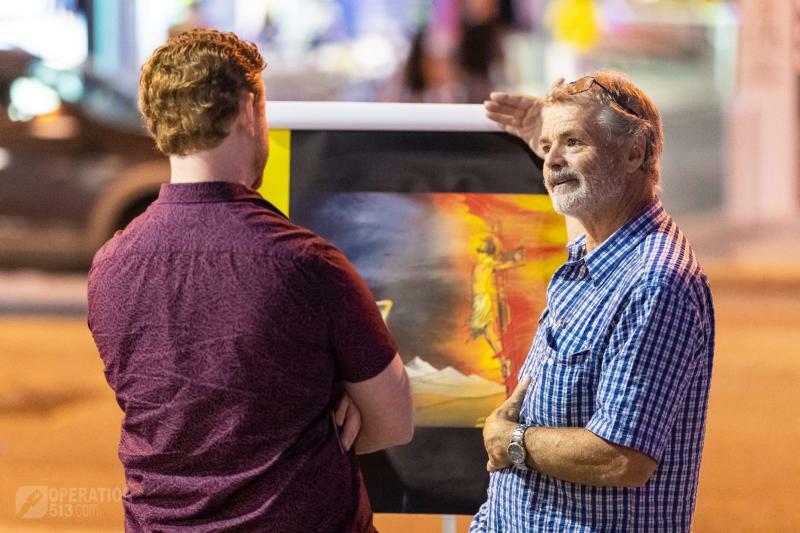 A similar conversation took place with a man who had a Hindu background. He at first tried to distract the conversation by declaring that Jesus went to India between the ages of 12 and 30. But was shown via Mark 6:3-4, that the people who Jesus was ministering to, knew Him as one who had grown up locally. Then he was taken through God's law and shown his guilt but this man didn't want to consider it either. He then gave some "sincere advice" as he called it. He said, "If you didn't talk about sin, judgement or Hell more people would be willing to listen to you". To which the response was given, "But if those topics were never raised there would be no reason to talk to anyone". Lastly a more encouraging conversation was with Pablo. He declared that he was a Christian but thought his entry to Heaven was on the basis of his obedience to God's law. He saw his guilt and its penalty and then for the first time in his life came to comprehend the gospel! He was moved and challenged. He said that he was so thankful to have talked to now understand the good news and now he will have to think about trusting in Christ. He too was emphasised with the seriousness of trusting in Christ. Without trusting in Christ, Easter is simply the reminder that God's wrath is yet to be appeased. Please be praying for Pablo that he would not hold onto anything, seeing that nothing else can save him and instead that he would cling to Christ as his only hope for life and to honour God! Please also be praying for the tall man and the Indian man, that God would humble them, show them that the things they are holding onto are foolish and have no ability to pay for their sin. Please pray that God would be gracious and cause them to turn to Him for salvation! Lastly, whilst it is holidays, why not find a time to come on out and step out of your comfort zone to tell others of who Christ is and what He has done! 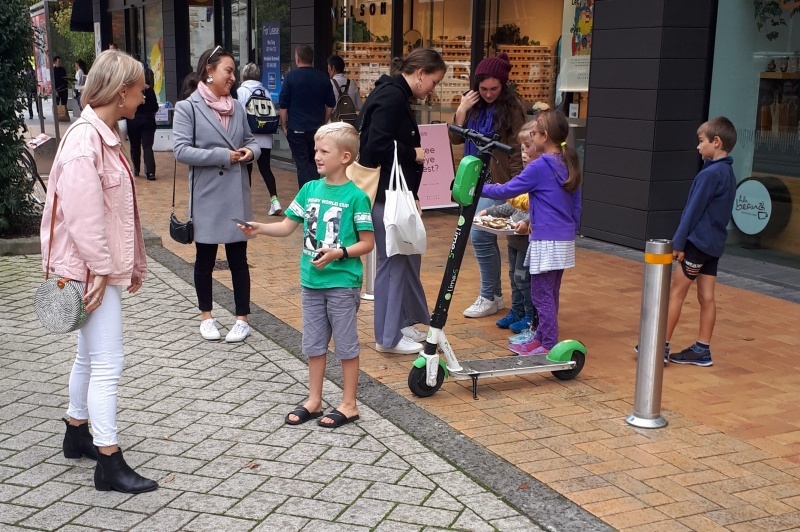 Tuesday and Wednesday saw the Christchurch (NZ) team try something different: door to door evangelism. It’s the school holidays, and apparently this is a good time to do it. I had the experience of Kim from OAC guiding me (always a good way to learn evangelism skills). Kim fielded the first few conversations, and I noticed he’d sometimes say: “We are not Jehovah’s Witnesses or Mormons”. 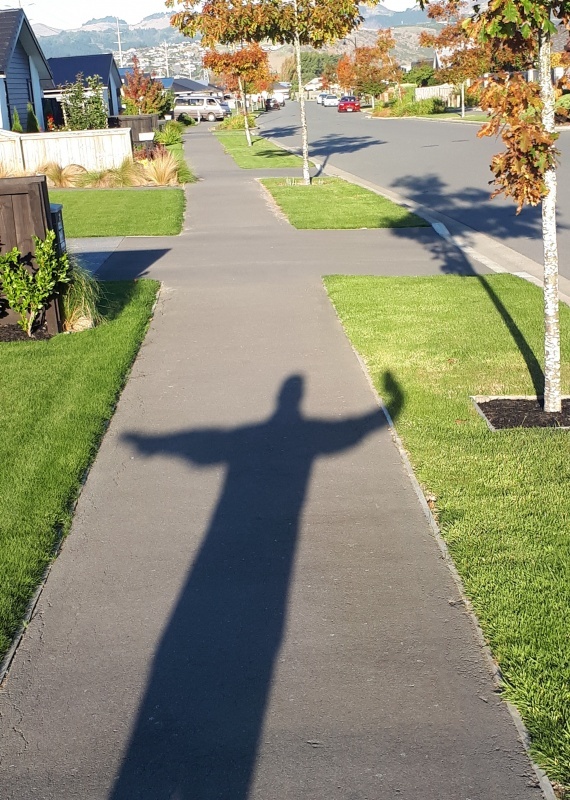 So one of the first conversations that I fielded, I had a man come to the door, and I said who we were and what we were doing, and I clarified by saying, “We are not Jehovah’s Witnesses or Mormons”. Well, the guy at the door said, “Oh, I’m a Jehovah’s Witnesses”! But externally I ignored it and quickly asked if he would be keen to discuss. He said, “I’ve got my own beliefs thanks”. It struck me that that is exactly what Christians often say to religious groups coming to the door. 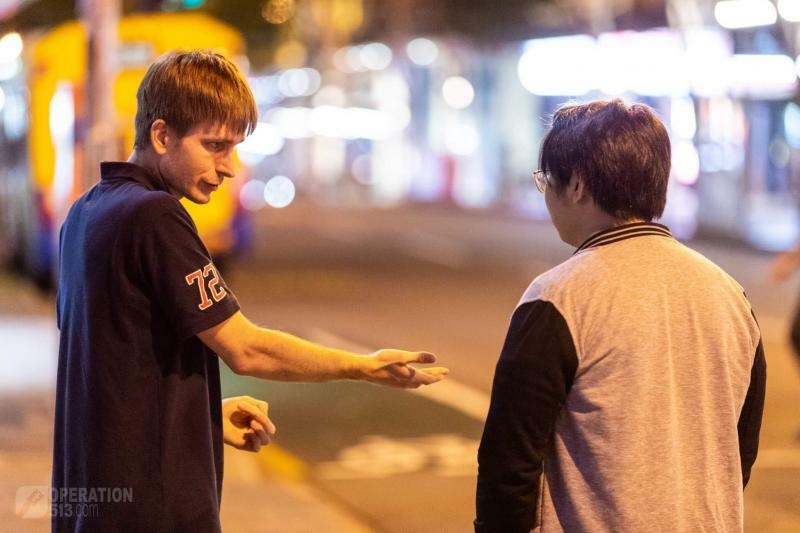 The roles were reversed! But some wonderful conversations were had over the two days of outreach. Afresh, I realised how many people the team are reaching in this city. 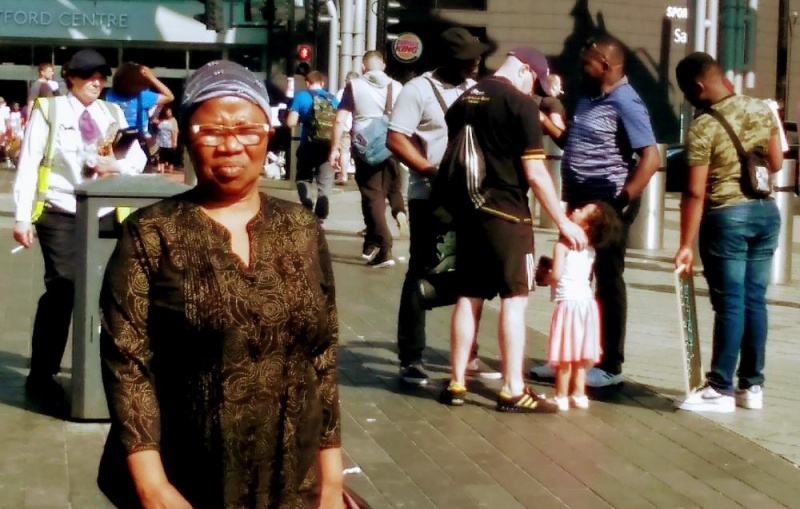 We were talking to a mother and her younger children, when an older son came out. He instantly recognised me and said that I had talked to him in the city (I don’t remember it)! 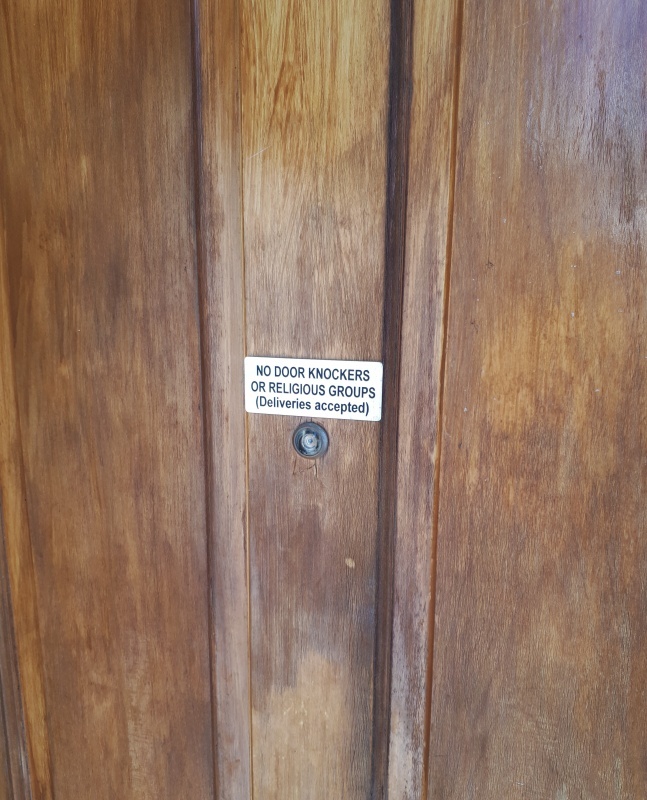 Later, we knocked on a door and a lady I had talked to at the Eastgate bus stops (maybe a month earlier) answered the door (we were door knocking very close to the Eastgate bus stops). She pulled out the Bible I had given her, and we had another opportunity to share the gospel. 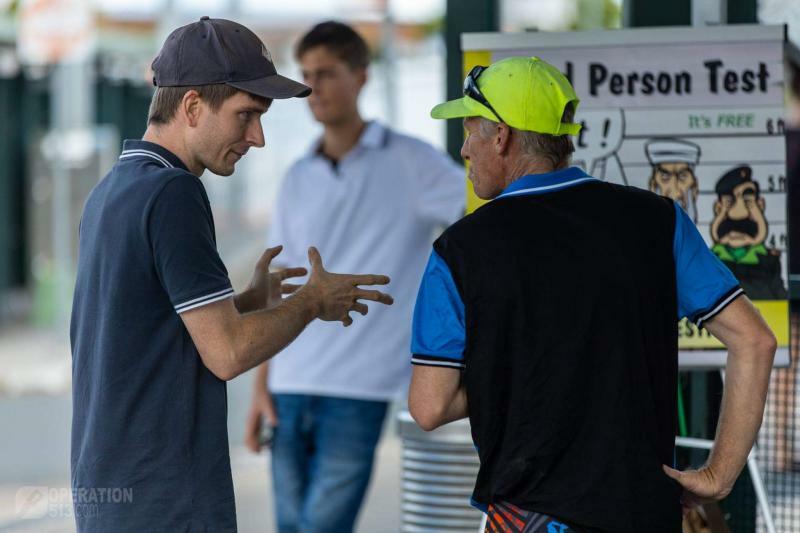 We had two wonderful situations where we were invited in and were allowed to discuss the Gospel in depth. It was a wonderful experience, and I’m very keen to try it again (which I’ll do next week).